Electronics rule our world, but electrons rule our electronics. A research team at The Ohio State University has discovered a way to simplify how electronic devices use those electrons—using a material that can serve dual roles in electronics, where historically multiple materials have been necessary. The team published its findings March 18 in the journal Nature Materials. "We have essentially found a dual-personality material," said Joseph Heremans, co-author of the study, professor of mechanical and aerospace engineering and Ohio Eminent Scholar in Nanotechnology at Ohio State. "It is a concept that did not exist before." Their findings could mean a revamp of the way engineers create all different kinds of electronic devices. This includes everything from solar cells, to the light-emitting diodes in your television, to the transistors in your laptop, and to the light sensors in your smartphone camera. Those devices are the building blocks of electricity: Each electron has a negative charge and can radiate or absorb energy depending on how it is manipulated. Holes—essentially, the absence of an electron—have a positive charge. Electronic devices work by moving electrons and holes—essentially conducting electricity. But historically, each part of the electronic device could only act as electron-holder or a hole-holder, not both. 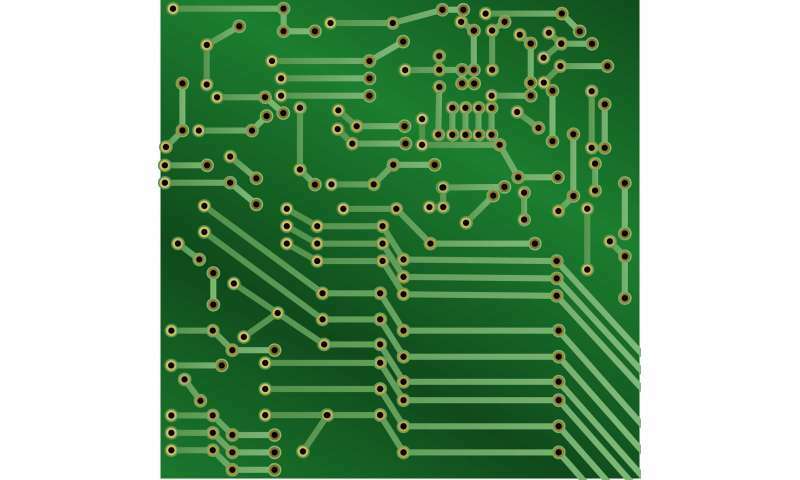 That meant that electronics needed multiple layers—and multiple materials—to perform. But the Ohio State researchers found a material—NaSn2As2, a crystal that can be both electron-holder and hole-holder—potentially eliminating the need for multiple layers. "It is this dogma in science, that you have electrons or you have holes, but you don't have both. But our findings flip that upside down," said Wolfgang Windl, a professor of materials science and engineering at Ohio State, and co-author of the study. "And it's not that an electron becomes a hole, because it's the same assembly of particles. Here, if you look at the material one way, it looks like an electron, but if you look another way, it looks like a hole." The finding could simplify our electronics, perhaps creating more efficient systems that operate more quickly and break down less often. Think of it like a Rube Goldberg machine, or the 1960s board game Mouse Trap: the more pieces at play and the more moving parts, the less efficiently energy travels throughout the system—and the more likely something is to fail. "Now, we have this new family of layered crystals where the carriers behave like electrons when traveling within each layer, and holes when traveling through the layers. ... You can imagine there might be some unique electronic devices you could create," said Joshua Goldberger, associate professor of chemistry and biochemistry at Ohio State. The researchers named this dual-ability phenomenon "goniopolarity." They believe the material functions this way because of its unique electronic structure, and say it is probable that other layered materials could exhibit this property. "We just haven't found them yet," Heremans said. "But now we know to search for them." The researchers made the discovery almost by accident. A graduate student researcher in Heremans' lab, Bin He, was measuring the properties of the crystal when he noticed that the material behaved sometimes like an electron-holder and sometimes like a hole-holder—something that, at that point, science thought was impossible. He thought perhaps he had made an error, ran the experiment again and again, and got the same result. "It was this thing that he paid attention and he didn't assume anything," Heremans said. Which physical mechanism is responsible for magnetic properties of cuprates upon doping? What? I don't understand this at all. Can anyone explain? "Now, we have this new family of layered crystals where the carriers behave like electrons when traveling within each layer, and holes when traveling through the layers. ..."
Holes (+) can be thought of as virtual protons. Protons in atomic nuclei don't move. Atom with a missing electron has positive charge, as if it is a proton. As a neighbor atom looses electron to positive atom, then proton ("hole") appears to move to neighbor atom. Something like that. Stack layers up a Y axis, so each layer extends out in X and Z axis directions. Electrons move in X and Z directions, while holes move up or down Y axis. I believe this is what they are talking about. So the key point seems to be the following: in this sodium-tin-arsenic crystalline solid the charge-carrying pseudo-particles have differing properties when moving in x or z axis directions versus when moving in y axis direction. Something like that. Right?